The ashes of former Prime Minister Atal Bihari Vajpayee were brought to Silchar on Thursday. The ashes will be immersed in the Barak river at Sadarghat in Silchar at 4 pm. The flight carrying the ashes landed at Silchar airport on Thursday afternoon at 12.40. 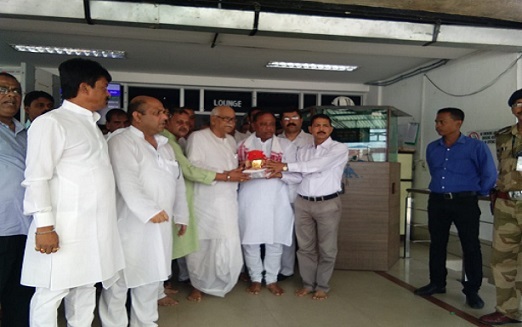 Minister Parimal Shuklabaidya, former union minister Kabindra Purkayastha and BJP leader Mission Ranjan Das received the urn at the airport. BJP leaders and legislators from Barak Valley were present at the airport to receive the urn. Later, a procession was taken out with the ashes of Vajpayee. The vehicle carrying the urn will stop at Shalganga, Udharbandh, Madhuramukh, Rangpur and Silchar. The ashes will be kept at Silchar Police Parade ground for public view. Assam minister Ranjit Dutta and BJP leader Rajdeep Roy, state BJP vice president Biswarup Bhattacharjya brought the urn to Barak valley. The urn containing the ashes of former Prime Minister Late Atal Bihari Vajpayee was brought from New Delhi to Assam by state BJP president Ranjeet Dass on Wednesday. Assam Chief Minister Sarbananda Sonowal formally received the urn from Dass. Assam ministers, state BJP officebearers, MPs and senior BJP leaders besides hosts of late former Prime Minister Vajpayee’s admirers were present at the LGBI airport on Wednesday.